On the bank of the Ganges. I made the decision to not share my thoughts on Varanasi right away. Of all the places we visited, Varanasi was by far the most intense, dirty, chaotic, and quintessentially Indian city of them all. Quite simply, I needed some time and space to fully reflect on what I had seen and experienced. Upon exiting the train, we were immediately thrown into the deep end of the pool. Varanasi station in the mid-day sun is packed shoulder-to-shoulder with travelers. The tuk-tuk drivers were more intense than they had been at any previous location, demanding 4-5 times the price over the value which we eventually settled. When we finally talked down a driver to a reasonable price, he first demanded that he take us to another hotel for commission, then tried to convince us to pay double (“No, 40 rupees each!“), and then finally tried, unsuccessfully, to get commission from the hotel where we decided to stay. We mostly stayed in the first day. Exhaustion from the overnight train and some mild stomach issues kept us from straying too far from the hotel. Our hotel, the Ganga Bank Guest House, was a nice place, run by an enthusiastic Indian woman whom Christine and I affectionately called “Big Mama” (though not to her face). She spoke English fluently, with great passion and expressive hand gestures. And she would finish nearly every sentence with, “You understand?” This seemed to be more of a statement than a question. The best part of the hotel, by far, was the rooftop garden, which became the perfect place to escape the hot, stifling room during a lengthy power-outage on the first night. 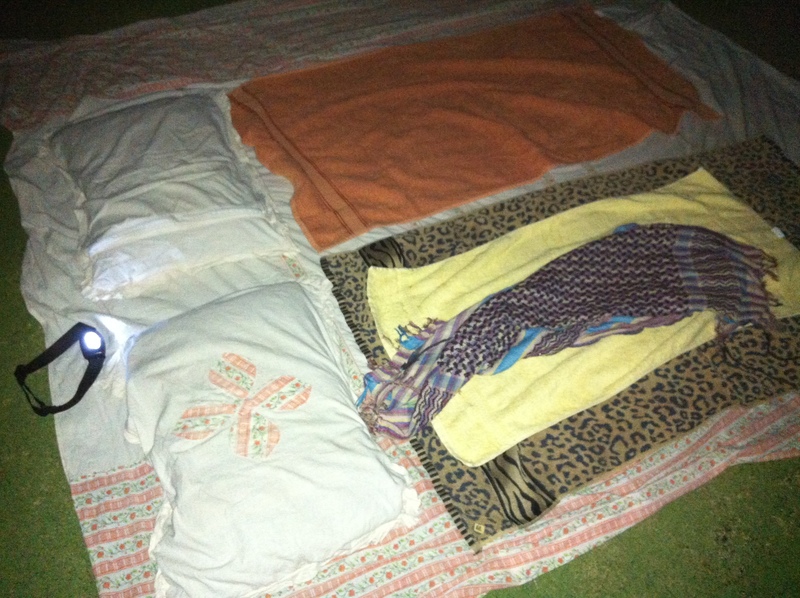 We brought a sheet, a couple of pillows, bug spray, and we were ready to go. The cool, grass-covered rooftop, some four stories above the madness of Varanasi, became our bed that night. Under the stars and with a cool, refreshing breeze blowing over us, Varanasi sang us a lullaby consisting of distant car horns, dogs barking, cows mooing, and the occasional firework. Overhead, the stars completed their nightly journey, with the Big Dipper slowly revolving around Polaris. Slowly, an orange crescent moon rose above the Ganges to the east. Around 3 AM, the temperature had sufficiently dropped and the bugs and sufficiently increased to the point where thought it better to spend the last couple of hours of the night back inside. The sun had already beaten us up when we awoke at a quarter to six. Big Mama had arranged for a boat ride on the Ganges River. The boat was a simple, wooden affair, powered only by two bamboo oars in the strong hands of our Indian guide. He was a man of few words, only stopping to point out the most important sites, such as the Manikarnika Ghat, the temple where bodies are cremated on an open funeral pyre on the banks of the holiest river in India. Every year, 80,000 bodies are burned in this fashion in Varanasi, averaging over 200 a day. Although we had been in Varanasi for less than a day, we both agreed that the boat ride was a much better way to experience the city. In doing so, we managed to get away from the tight streets and alleyways, and the near-constant harassment from Indians looking for a few rupees. It was very relaxing, although the vision of watching the locals bathe and wash their clothes in this highly polluted river–often mere meters away from a burning corpse–will stay with me for quite some time. And the smell has surely put me off barbecues for awhile. 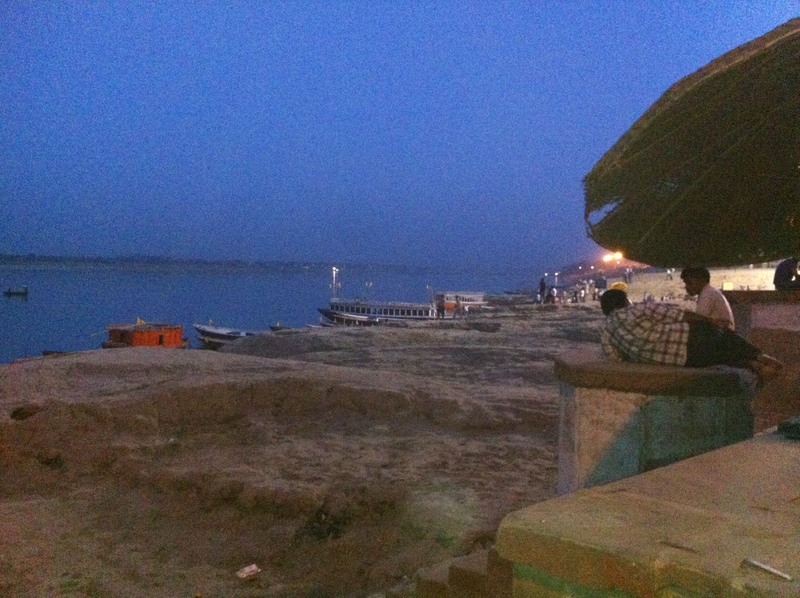 We stayed in Varanasi a day longer than we had originally expected. Varanasi is not a forgiving place, and that extra day pushed us to our limits–with India, with Indians, and with each other. We were both suffering some ill effects from the food (which is apparently common in this city), and the Indian heat was worse on this day than during the rest of the trip. We were annoyed at the constant hassle, the periodic stomach cramps, and the fact that we couldn’t get out of the oppressive Indian heat for another 24 long hours. The first annoyance, as trivial as it now seems, came when Christine lost her sunglasses early in the day (I swear, I never saw them! ), so I tried being super friendly to her, which only annoyed her more. We went through long and rather uncomfortable silences as we wandered through the back alleys of this maze of a city. The most exciting moment came when a dead body, en route to the Ganges, came barreling down the narrow passageway, hoisted over the shoulders of men chanting and singing. Christine was very keen on seeing this funeral procession when she read about it, but in person, she let out an involuntary shriek and hid behind me. My reaction could probably be best described as indifferent. Unlike my travel companion, I wasn’t really looking forward to seeing the procession, but my fascination seemed to counteract my repulsion. The body passed mere inches from my face as they turned a corner and headed down toward the river. Moments later we were sitting down to a nice breakfast. Although we were able to get a handle on our annoyances with each other, the biggest hassle was yet to come. We went back to a travel agency to pick up train tickets and to try to arrange for a couple of flights around the country. We had both heard about how cheap the airfares were in India, but it turns out that “were” is a past tense verb. On April 1st, the government had raised domestic airfares by 40%. As such, I spent about two hours at the travel agency, and Christine spent well over three, trying to find the best fares. This process was only made worse by the regular power outages, which halted any forward progress that had been made. We had been planning on taking another boat ride to watch the sunset, but the sun had long gone down by the time we finally managed to book all of our tickets. We still had to pay them, but they agreed to wait for us to take a boat ride, insisting that we needed to see the puja (ritual dance with fire on the banks of the Ganges) before we left the city. The final boat ride proved to be absolutely necessary. They were right, the puja was excellent, and the calm of the (incredibly polluted) water helped to sooth our raw nerves.